Civil courage and anti-racism institution, ZARA, said it had been informed of 745 cases of racist abuses in Austria last year. The organization, which stressed that the actual number of offences is much higher, emphasized that the number of verbal abuses of devout Muslims wearing headscarves was on the rise. ZARA explained Muslim women were experiencing difficulties applying for jobs in Austria if they are unwilling to remove the scarf during working hours. 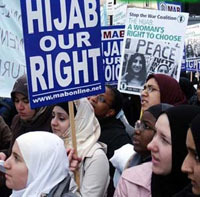 The organization claimed these developments were primarily not based on racist tendencies among businesspeople, but their concerns that the number of clients may decline if a headscarf-wearing woman was hired. Another aspect ZARA is emphasizing in its report is “reckless” and often anonymous posting of racism-fuelled messages on social networking sites. The Vienna-based organization said the fight against such actions was becoming more difficult since notes have often been read and passed on by many people before they get removed. Muslims and Afro-Americans in Austria are the main groups experiencing day-to-day racism in Austria, according to ZARA. The institution also criticized the country’s police for carrying out more so-called ethnic profiling in which black people and members of other minorities are being questioned and asked for their IDs only because of their origin and skin colour. ZARA’s announcements come shortly after a poll revealed that fewer than one in five Austrians think of ethnic minorities as a group in need of protection. The survey – carried out by research firm Karmasin – also showed that two in 10 Austrians said the same about migrants and asylum seekers. A meagre 13 per cent of Austrians told the pollster that religious minorities should get more protection in the country. Karmasin reported that a majority of 53 per cent agreed with the claim that people applying for political asylum in Austria “are more criminal than other social groups”.